LAKE COUNTY >> A $65 million project that is the first third of a $195 million plan to turn eight miles of Highway 29 into a four-lane expressway from its current two-lane status has been funded from federal, state and county sources and is set to begin construction in the summer of 2019. CalTrans District 1 Public Information Officer Cori Reed said that the project is “ready to lift, meaning that bidding will begin in January 2019.” Read the full article. NOTICE IS HEREBY GIVEN that the Lake County/City Area Planning Council (APC) has prepared a draft Regional Housing Needs Allocation (RHNA) pursuant to Government Code 65584 et. 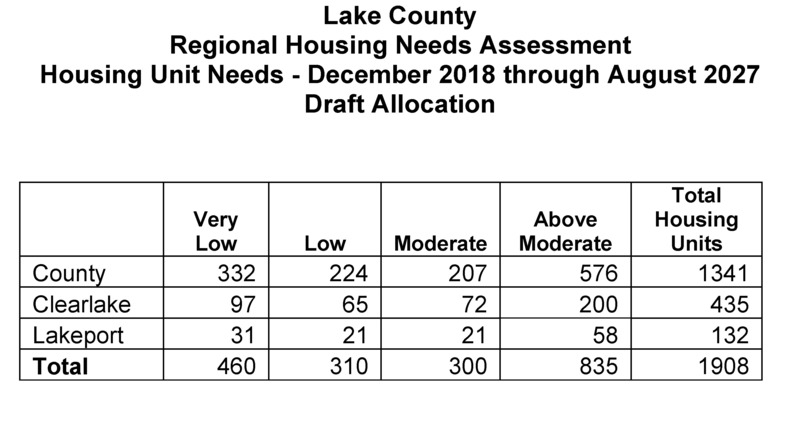 Seq., which proposes a distribution of needed housing units within Lake County and the incorporated cities through 2027 as estimated by the State of California Department of Housing & Community Development. The draft RHNA is now available for public comment. Comments may be submitted to the Lake APC at 367 N. State Street, Suite 204, Ukiah, California, 95482. A public hearing will be held by APC to adopt the final RHNA Plan on August 8, 2018, at 9:00 a.m. or as soon thereafter as possible, in the Lakeport City Council Chambers, 225 Park Street, Lakeport ,CA. The public comment period will be open until the time of adoption. For further information, please contact our office at 707-234-3314. To find out, the Lake Area Planning Council will be developing a walking needs inventory. The inventory will identify those projects that would most improve walking in the county’s two cities — Clearlake and Lakeport — and in the unincorporated communities. Your feedback is welcome through the LakeWalks web page. Lake Transit Authority has launched a shopping shuttle to assist those who have been affected by the recent fire at Hardester’s Market in Middletown. The shuttle will provide transportation to residents in the surrounding area to other grocery stores and shopping centers. Read the press release to learn more about the shuttle, or, to arrange a ride call 994-3334 at least 24 hours in advance. Lake Transit said if no one is signed up by noon on Mondays, the service will not run the next day. On Monday, June 4 at the regular meeting of the Mendocino Council of Governments (MCOG), Executive Director Phil Dow announced his retirement after a career of more than 40 years in transportation. Mr. Dow has also been under contract with the Lake APC to provide Planning Services for over 25 years. He has chosen Nephele Barrett as his successor, starting immediately. The recent MCOG Press Release highlights Mr. Dow’s accomplishments.